Very amusing but wrong in some of the fine detail. 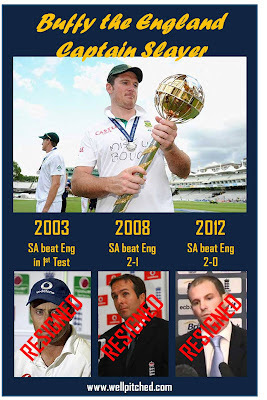 England and South Africa drew the first test in 2003 before Hussain quit. Vaughan proceeded to lose the next Test at Lord's and the 3rd Test at Headingley, winning the other two. Similarly, when Vaughan resigned SA had won the series 2-0 - KP led the side to a consolation victory afterwards.